Starbucks has become a bit of a case-study example for marketers when it comes to creating social buzz for its products, and in no season is that more evident than fall when it sells the popular pumpkin spice latte drinks. To measure the hype (and subsequent hate) of the latte, social media analytics company Spredfast crunched a handful of stats in the week leading up to Tuesday when the drink was launched on menus. Per the firm's findings, chatter about the drink spiked on Wednesday when at one point users fired off 5,076 tweets per minute. To compare, in the week leading up to the launch, the maximum number of tweets at one time was 2,855. In total, the phrase 'pumpkin spice latte' and the abbreviated hashtag #PSL have racked up 56.8 million tweets. To compare it to chatter about the brand's s popular #pinkdrinks this summer, which received more than 11,000 tweets, tweets tagged with #psl, 'pumpkin spice' or #firstPSL have generated more than 25,000 tweets. On Instagram, there have been more than 731,000 posts tagged with #pumpkin related to the drink and another 468,000 are labeled with #PSL. Moreover, Starbucks' pumpkin spice lattes receive 493 percent more likes per photo than shots tagged with #Starbucks. 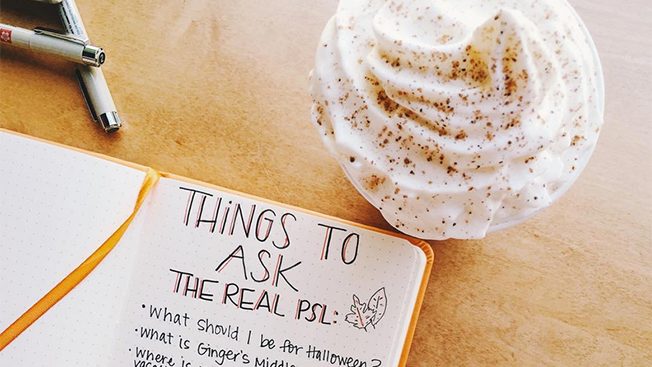 Beyond social chatter, Starbucks also recently launched a Facebook Messenger bot for its Real Pumpkin Spice character that lets users ask the drink questions and access GIFs and photos.